Architect Jesse Garlick’s rural Washington vacation home references its rugged surroundings. The steel cladding has developed a patina similar to the ochre-red color of bedrock found in the area. The restrained 820-square-foot interior is defined by the angular ceiling. Garlick left the prefabricated structural panels unfinished to save on material costs. 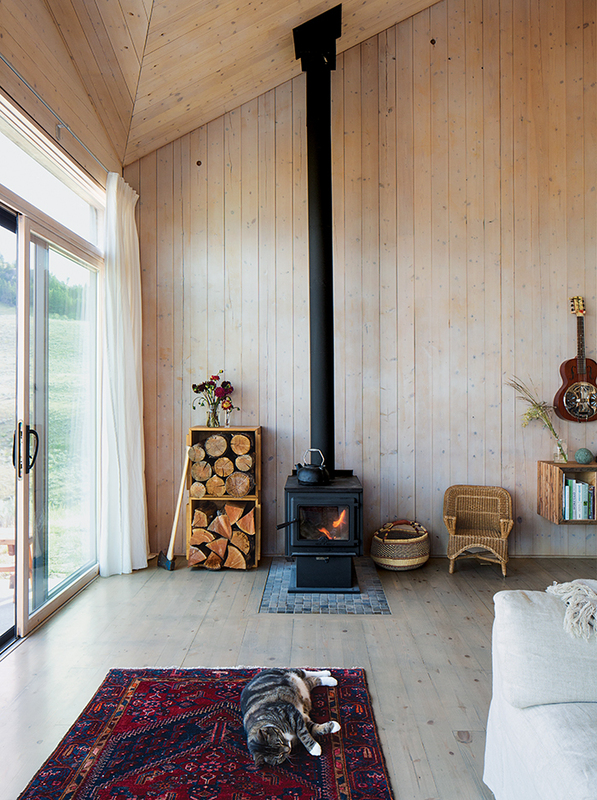 A True North wood stove from Pacific Energy heats the house. Max, the family’s cat, naps on a vintage rug purchased on eBay. The kitchen island is topped with PaperStone in slate and wrapped in the same steel used to clad the house’s facade. “We matched the color to create a ‘2001: Space Odyssey’ monolith,” Garlick says. He and his wife, Susan Elliott, a chef, cook at the commercial Wolf range they purchased at a restaurant supply store. The Bristol stool on the second story landing is by Modern Home. Taking inspiration from train cabins, the guest bed lifts to reveal a bathtub. Garlick made the mechanism using sailboat hardware. The velvet curtain is by Restoration Hardware and the tile is from Stone Tile. The floating bookshelf is composed from wood found on the property. Garlick purchased the Technics turntable and receiver from a used audio store. The bedroom is outfitted with only the basics. A narrow building next to the main structure houses storage and an outdoor kitchen. When Vancouver-based architect Jesse Garlick was growing up, his family used to take him sailing. Those aquatic outings instilled a love of solitude, design, and self-sufficiency that inspired him to join his profession. 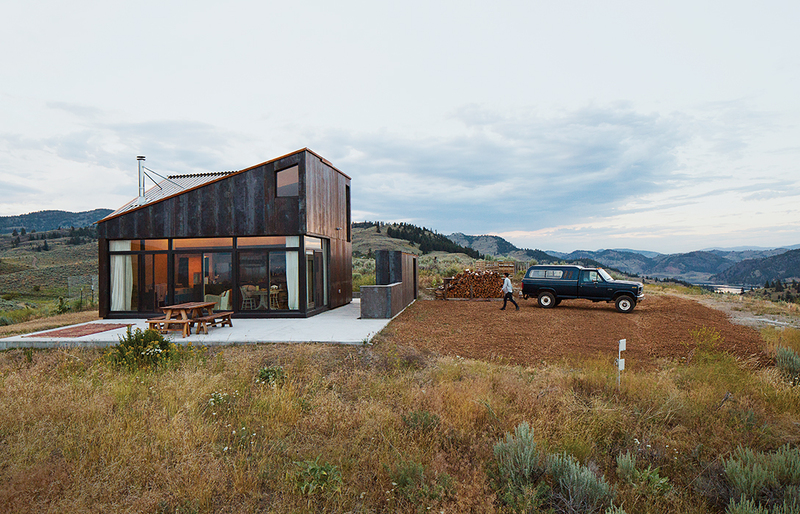 But when Garlick and his wife, Susan Elliott, decided to build a vacation retreat, they chose a different kind of geography and challenge: a prefabricated, off-the-grid home in eastern Washington’s high desert. The site’s location near the tiny town of Oroville, Washington, made prefab construction a logical choice. 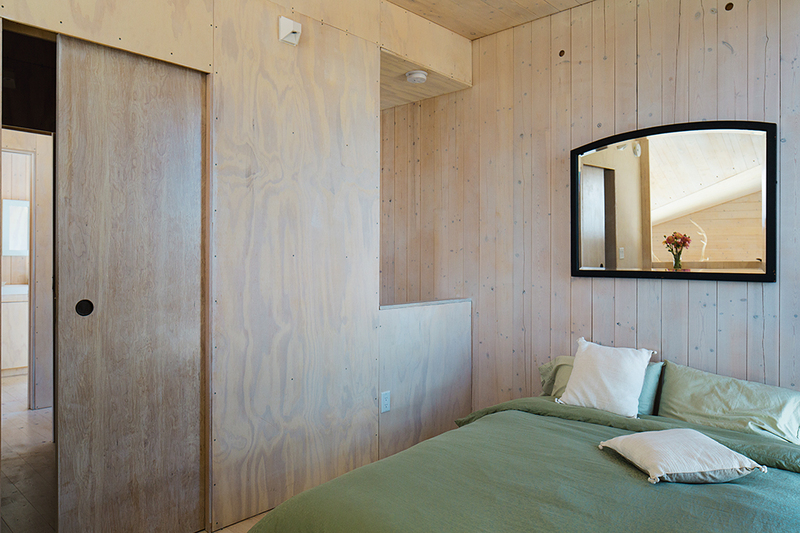 The 820-square-foot, two-story home was built from solid cross-laminated timber panels and sheets of unfinished raw steel, all manufactured offsite. The heavy onsite construction required a 15-ton mobile crane and a four-person team and only took three days—but there were moments of uncertainty, like when the truck carrying the materials couldn’t make it up the hilly road to the house. Luckily, a friend of a friend on a nearby ranch offered use of his dump truck and trailer. A skeleton crew of two to four people completed the remaining work over the course of three months, due in part to Garlick’s wise material choices. He specified 80-pound steel panels to clad the facade because they were the biggest size he and his brother could lift into place. “Even though they were made by machine, at the end of the day, they needed to be installed by humans,” he says. The house uses solar power for electricity, propane for heating and cooking, and a well for water. The interior temperature remains comfortable without the use of air-conditioning, despite the region’s often high summer heat. Garlick designed a two-story house with a compact footprint in order to optimize passive strategies, like the stack ventilation effect: Heat rises in the tall space, eventually escaping through aptly placed windows, which causes cooler air to continuously flow into the building’s lower portion. By using solid cross-laminated timber for the structure and specifying mineral-wool insulation, Garlick helped the building avoid dramatic temperature spikes and drops. “Log cabins hold their mass in a similar way,” he says. The relatively small floor plate doesn’t keep their family (or a succession of guests) from enjoying moments of luxury. Thanks to a self-supporting, origami-like faceted roof, Garlick was able to forgo structural columns inside and have an open interior. The ground-floor kitchen is much larger than the family’s Vancouver apartment and features a commercial-grade Wolf range and a sizable island covered with a slab of PaperStone in their slate hue.